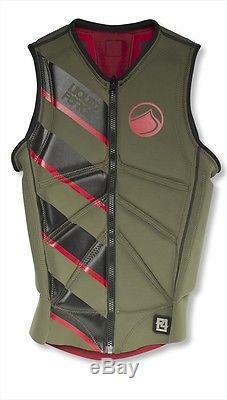 Liquid Force Z Cardigan Zip Wakeboard Impact Vest, Small or Large. Liquid Force Z Cardigan Competition Wakeboard Impact Vest Fully reversible with new front Zip. The Cardigan Competition Vest is the thinnest and most flexible of the Liquid Force vests, and with a new front zipper, the Z-CARDIGAN is lighting fast to get on, and will fit you snug and secure. The Z-CARDIGAN is a lightweight impact vest with a sleek pattern that moves with you. This has always been one of the lightest and most comfortable vests on the market. Now with a front Zip the vest is even better It continues to grow in popularity and justifiably so. Ultralight, quilted and segmented foam provides you with a lightweight vest that fits perfectly. It has a fully tapered fit with a scooped out neck and enlarged armholes. An added bonus is that this vest is reversible. This vest is a favourite of our team for good reason. SIZES: Small: Chest 34 - 37" / 86 - 94cm Medium: Chest 37 - 40" / 94 - 101cm Large: Chest 40 - 43" / 101 - 109cm X Large: Chest 43 - 46" / 109 - 117cm. Liquid Force Z-Cardigan Impact Vest Product Details. Flex Neoprene The Liquid Force Flex Neoprene is like a second skin. This super stretchable neoprene fabric has been engineered to move with you, absorb less water, and dry fast. Flex Neoprene when combined with our high performance Stretch-Light lining panels, makes the Liquid Force Cardigan the standard for all pullover vests. Flex-Architecture Designed to move with you the Cardigan features an advanced 16 segment Flex-Architecture design. Reduced side panel foam and open center back allows maximum range of motion. Chest panel segments let you move. The Cardigan features our best light weight PVX high impact flotation foam. PVX is ultra light, soft, stretchable and flexible. US Coast Guard approved formula is lab tested and certified for low water absorption and provides excellent impact protection. Smart Fit Designed to fit like a second skin the Cardigan has a tapered waist and wide arm openings. Flat waist pattern and wide shoulders keeps the vest close but lets you move. The neck opening and arm holes edges are rolled for maximum comfort. 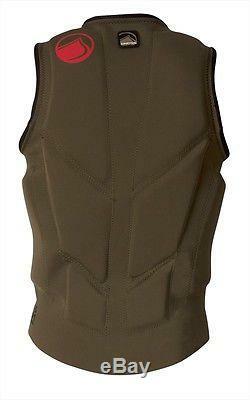 This is a Competition vest designed to be thinner and lower profile than an approved flotation vest. It will give great freedom of movement BUT it is designed to be VERY SNUG. We are dedicated to ensuring the highest possible quality service to our customers. You can send us a message by using the "Questions and answers" section towards the bottom of the page. 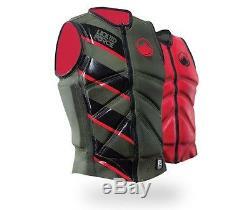 The item "Liquid Force Z Cardigan Zip Wakeboard Impact Vest Green/Red S M XLarge 61347" is in sale since Tuesday, November 29, 2016.